Kranji War Cemetery, Collective Grave, Plot 30, Row A, Grave 9-13, Age 23. In a common grave at map reference 784112. 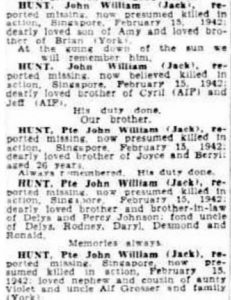 John William Hunt known as Jack enlisted at Northam on 8 September 1941. Jack sailed to Singapore on 16 January 1941 as a stretcher bearer with Battalion Headquarters. 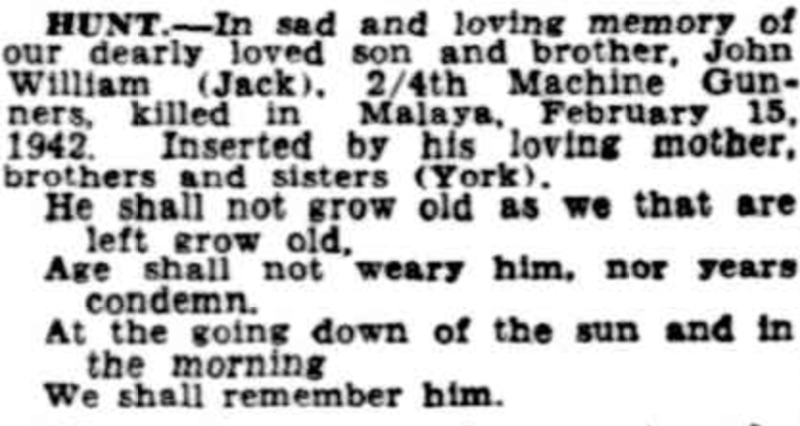 Jack lost his life 5 months later when killed during an enemy artillery barrage at Buona Vista during the final days of the Battle of Singapore. He was 23 years of age. 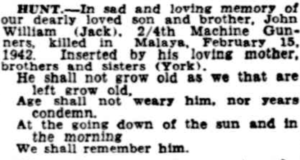 Jack’s family did not learn of his death until after the end of the war.